Your #4 sciatica stretch is Low Trunk Rotation. By doing the lower trunk rotation, you will be increasing flexibility in your lower back and hips which will allow for greater mobility and rotation in the spine. Start position: Find a nice firm flat surface and lay down on your back. In the footage above Dr. Amy is using a mat table but if you don’t have one of these you can either use your floor or your bed as your flat surface. Start by lying down on your back. Bend both of your knees so that your feet are flat on the floor. Rotate your head towards the opposite side of your knees to feel a greater stretch. Hold your legs on the side for a 20 second count. Then slowly bring both legs up to center. Repeat this stretch on each side and hold for 20 seconds for 3 repetitions on each side. Gently swaying your knees back and forth can be very relaxing but it also helps move the facet joints along the low back, providing them with nutrition and lubrication. Doing this exercise correctly can ease your sciatica pain. People often do these stretches incorrectly. To watch the video of Dr. Amy explain and perform the low trunk stretch click here to sign up for our Top 10 Sciatica Tips and Videos for Sciatica Stretches. These at home exercises are provided to relieve your back pain in conjunction to the treatment at the Illinois Back Institute we can heal your back pain naturally without drugs or surgery through Functional Disc Rehydration™. 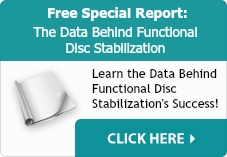 For additional information on Functional Disc Rehydration, please visit the Request a Consultation at Illinois Back Institute. Our non-invasive treatment method has helped many people overcome sciatica and other back pain issues.